Pasteis de Nata recipe | Oh. You here. 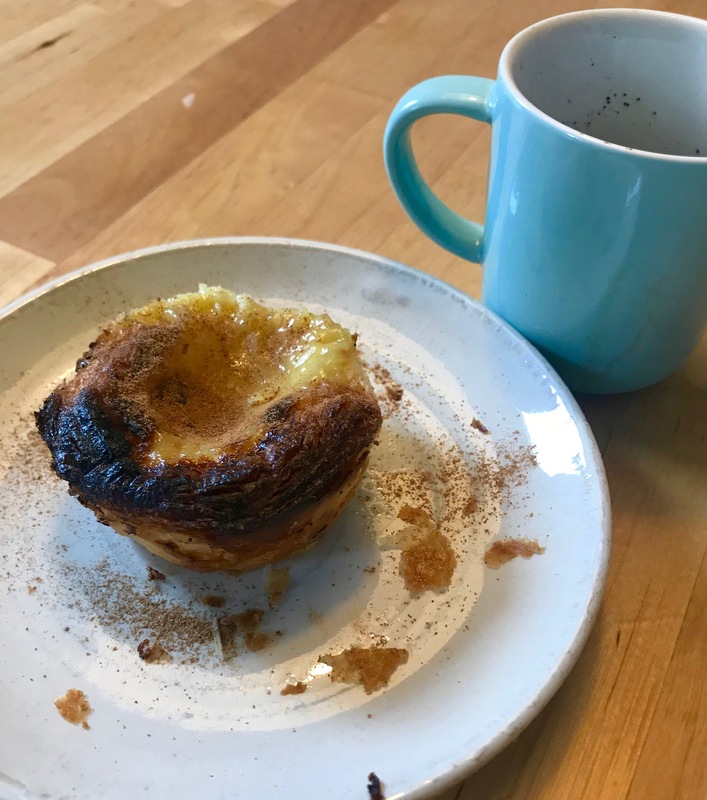 There are two secrets to pasteis: First you need to roll up the puff pastry instead of folding it in the last step, and you have to bake them short and super hot, as hot as your oven can go. If you can’t go higher than 240 °C, add the grill to help with charring the top of the pasteis. The receipe has two parts, the pastry and the custard. Both can be prepared ahead of time and kept in the fridge for up to 3 days. Put the flour and the salt in a food processor. Add 50 g of butter. Blitz until crumbly. Add water to the running machine until the dough just comes together, you might need less than the 140 ml. Shape into a ball and chill for at least 30 minutes. Roll out the ball to a cross shape by cutting a cross halfway through the ball and unfolding the flaps. Put 250 g of butter as a block in the center of the cross. Fold over the flaps and squeeze out the air. Seal the edges, turn upside down and roll out into a long rectangle. Fold over one third in the middle and another third on top of that. Flip over, rotate 90°, roll out into a long rectangle. Fold as before. Chill for 30 minutes. Repeat the rolling and folding: roll, fold, roll, fold, chill. Finally roll out the dough into a rectangle of roughly 3 mm thickness. Roll up along the long side into a sausage, divide in two and chill for at least 30 minutes or over night. Over night chilling helps with giving a really crispy result. Make a sugar syrup with the sugar and the water. Put in a pan, heat until around 100° to dissolve the sugar. Add the cinnamon and let infuse for a bit. Don’t overheat or you’ll get caramel. Don’t stir, just slowly heat up. Meanwhile whisk a bit of the milk into the flour in a large bowl until you have a paste with no lumps. Heat the rest of the milk to almost boiling. Pour the hot milk into the flour paste and whisk. Remove the cinnamon stick from the syrup and pour the hot syrup into the milk mix in a thin stream while whisking furiously. Add the vanilla extract. Let the mix cool down until hot to the touch (less than 60 °C). Whisk in the egg yolks and strain the mix into a jug for easy pouring. The mix is really thin. Cool down to below 30 °C. Can be chilled overnight. Take the log of puff pastry from the fridge. Roll back and forth to a thickness of about 4 cm. Cut into 2 – 2.5 cm disks and place cut side down in a muffin tin. You should get around 12 – 18 disks, depending on the thickness of your roll and the size of your muffin tin. Place a bowl with water next to your tin. Wet your fingers and shape into a cup. Using your thumb press down the middle of the disk and slowly shape out like a bowl of clay. The bottom should be thin but you should not see the tin through it. The rim should stick out just a bit over the tin. Mould all disks into bowls. Fill the bowls with the custard. Fill only to about two thirds, the custard will expand. Don’t add too much to any one cup, as it won’t cook properly. Large cups are better left half filled. Put in the oven on the top shelf just under the top of the heating. Bake for 8 – 10 minutes, watching them towards the end of the baking. You want black spots appearing on the custard without burning the pastry. 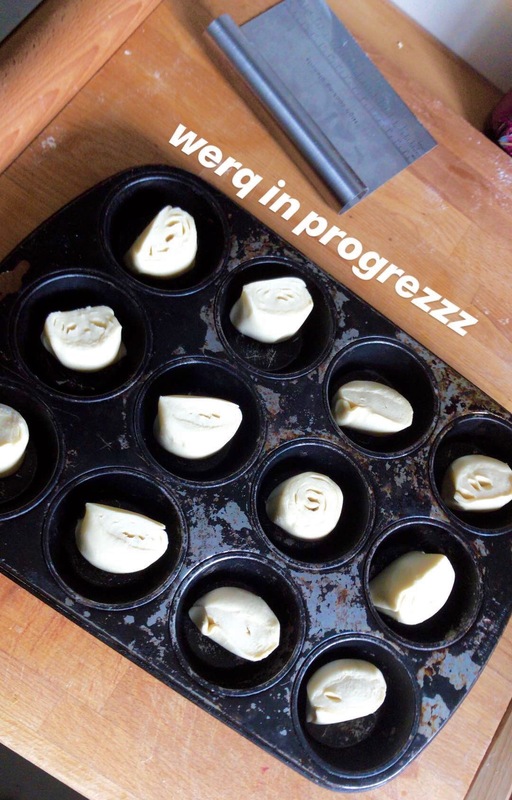 They’re ready when the first pastry edges turn almost black and the rest is nice and brown. Take out, leave to cool, remove from tin. Sprinkle with a bit of cinnamon before serving, eat within one day, best warm and with a cup of coffee. If the pastries cook unevenly, reduce the amount you bake at once. Leave the center spots of a 12 muffin tin empty, as they don’t get as much heat as the others. If the custard doesn’t set after cooling, use one more egg yolk or a bit more flour the next time. Store bought pastry could work, I don’t know. Don’t hesitate to make your own pastry, it is easier than it sounds and it’s perfect for weekend baking. Some recipes call for cream in the custard. This makes the tarts heavier than they already are. I don’t use cream in the custard. The custard can be seasoned. I will try matcha soon instead of vanilla, other options include, but are not limited to, cardamom, ginger and lemon or a dash of raspberry jam. Don’t call them pasteis then, though. I reduced the amount of sugar. If you like it sweeter, add up to a total of 260 g of sugar to the syrup. I adapted this recipe from several recipes I tried in the past. This is my current preferred version of a home made pasteis de nata.